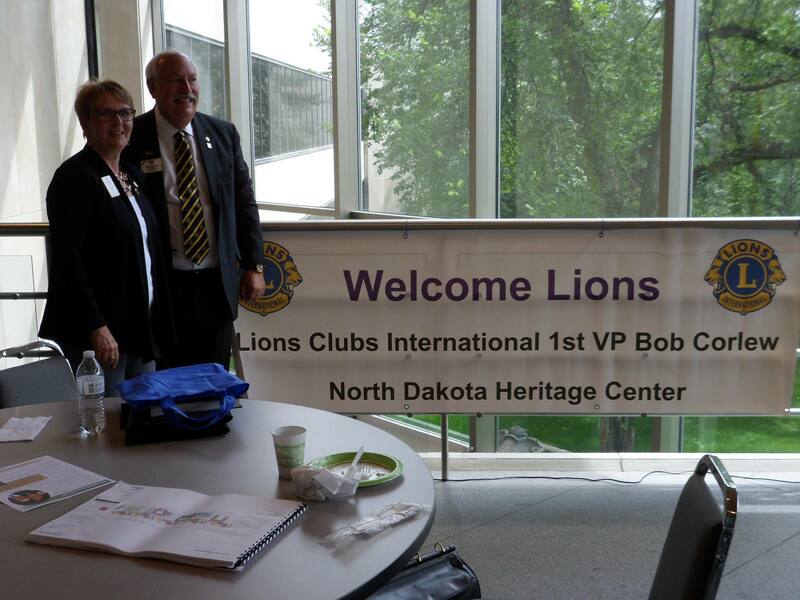 Returning from Honolulu to Fargo-Moorhead provided a short break from our travels, but we soon found ourselves involved in local Lion activities and going to Bismarck/Mandan to be part of the official visit of LCI Vice President Bob Corlew. 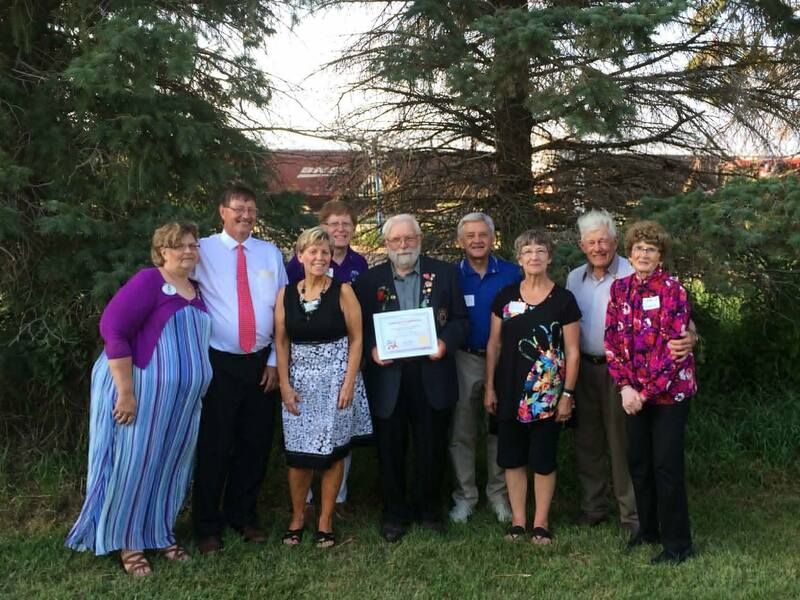 Sheldon Lions, under the leadership of PDG Gerald Sletmoe Celebrate 50 Years of Service with current DG, ID, two PIDs, and spouses. 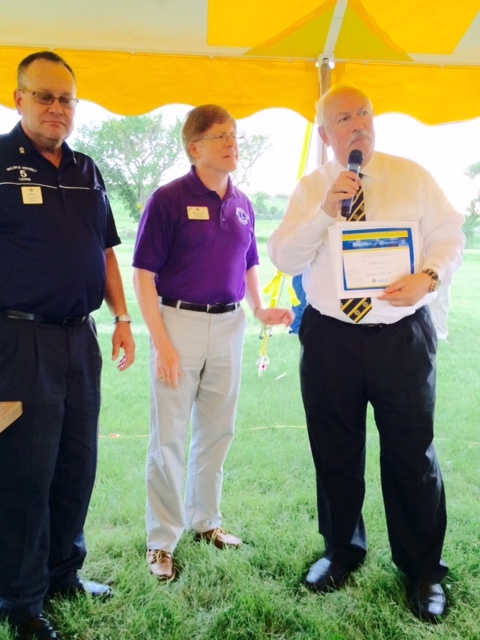 Our first activity was the 50th Anniversary celebration of the Sheldon (ND) Lions Club. The only remaining charter member, PDG Gerald Sletmoe organized a pitchfork barbecue supper that brought Kathy and me, along with two Past International Directors and their spouses–Bill and Marilyn Gackle and Bruce and Julie Schwartz–and representatives from 12 clubs to the event. District Governor Rick and Kristi Swenson made their first official visit, and several other PDGs were in attendance. 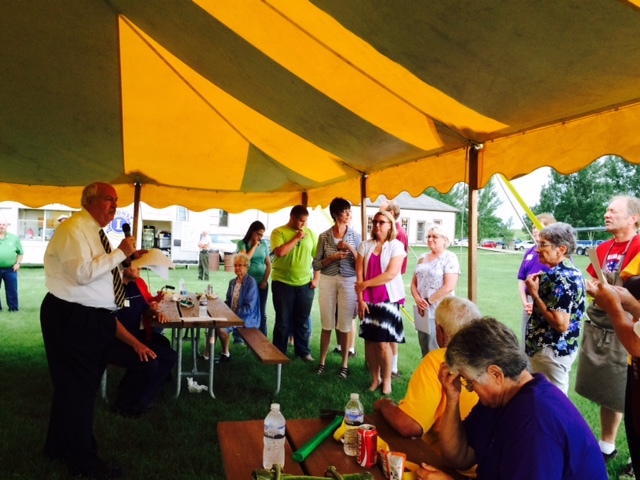 Area Lions Clubs assisted with the barbecue and providing the large tent. It was a fun night. Thinking back to the event, after returning from the international convention and the 18,000+ delegates, it was surreal for me to be standing on the prairie of North Dakota talking to my fellow Lions about service, when these Lions and their families are the backbone of their communities. It made me feel connected to my roots and the warmth and support shown to Kathy and me was much appreciated. 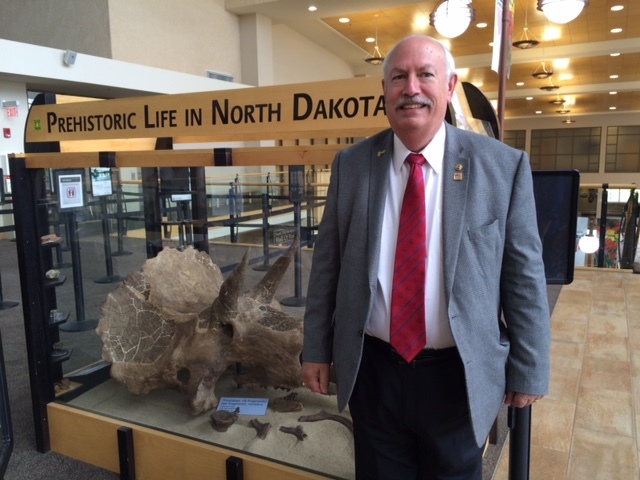 VP Corlew arrives in North Dakota! Two days later, Kathy and I were traveling to Bismarck/Mandan to be part of the eight day visit by Vice President Corlew. This was the first visit by an executive officer (while in office) to the Multiple District in recent history. The Lions of MD5 rolled out the red carpet and made VP Corlew’s visit one we hope that he will never forget. The generosity, commitment, and loyalty of the Lions of MD5 was evident throughout his visit. 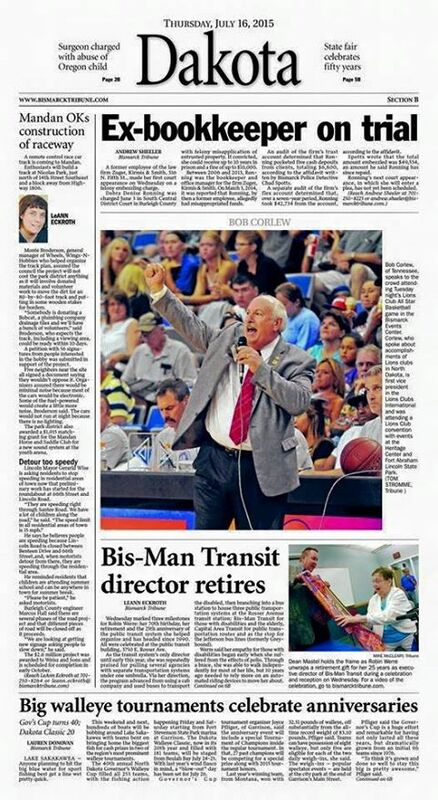 VP Corlew arrived in Saskatoon, Saskatchewan on July 9th. In the company of Past International Directors Marvin Chambers and Garnet Davis, VP Bob toured various Lions projects such as a Lions playground, skate board park, ice skating arena and the site of a new playground/park. Stars Ambulance Service serves Saskatchewan and Alberta, Canada. 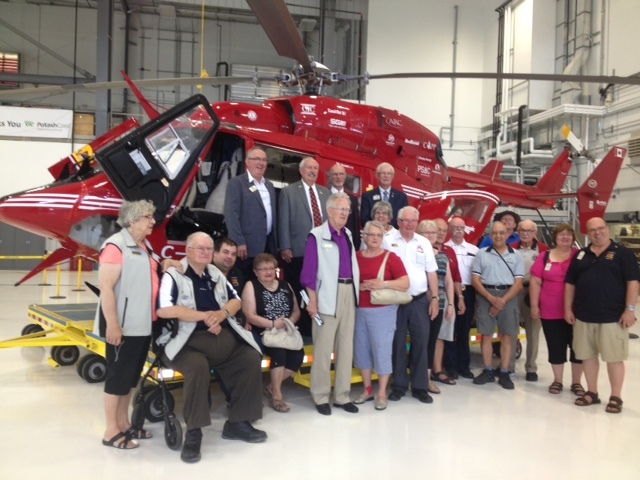 The group toured the STARS hangar at the airport, visited the Lions Eye Bank of Saskatchewan, and concluded with a lunch at the Berry Farm. 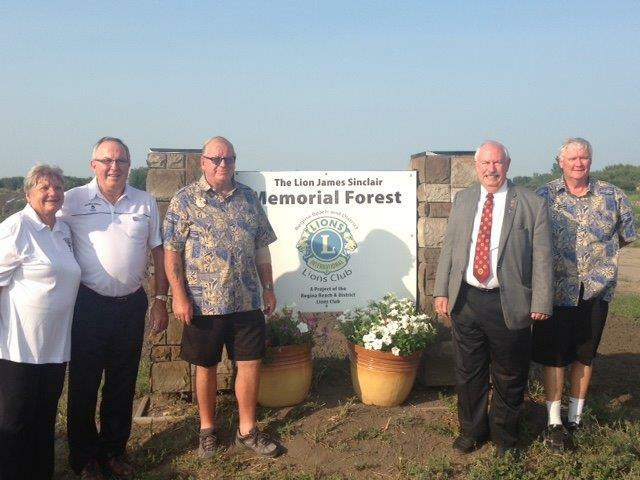 On the way to Regina, VP Corlew went to the Lions Memorial Forest. Lions are memorialized at the James Sinclair Forest. In Regina, the group visited two projects: the children’s playground in Victoria Park and a Lions baseball park started 50 years ago. 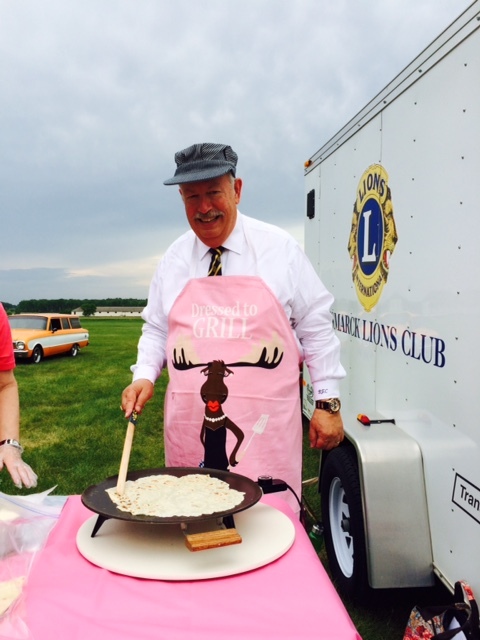 The Lakeside Lions hosted at a hotdog sale, where VP Corlew donned an apron, grilled hotdogs, and had lunch. The group moved on to the Royal Canadian Mounted Police grounds for a guided tour. On his last day in Saskatchewan, he saw Wascana Park, the Legislative grounds, and the Mackenzie Art Gallery. He ended his visit at the Milky Way Soft Ice Cream Stand–a popular Regina attraction. 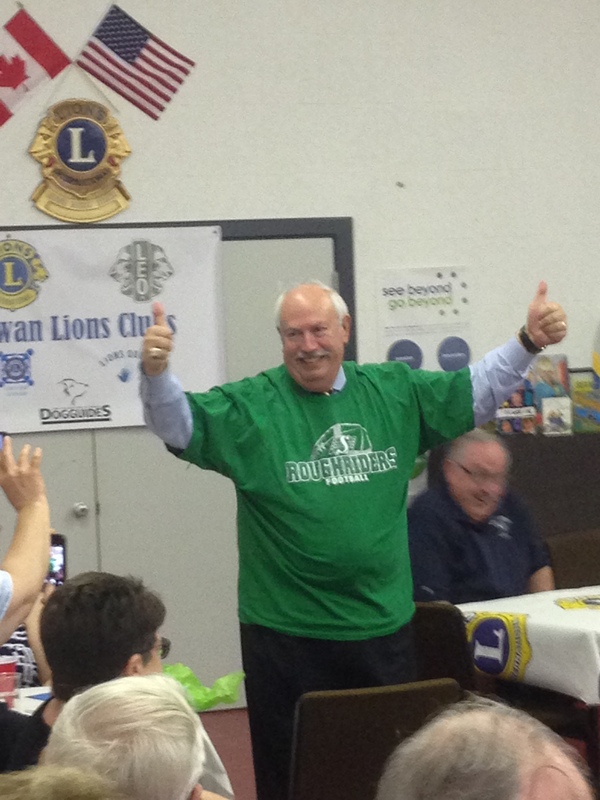 Saskatchewan Lions make VP Corlew one of the team to support the Rough Riders. 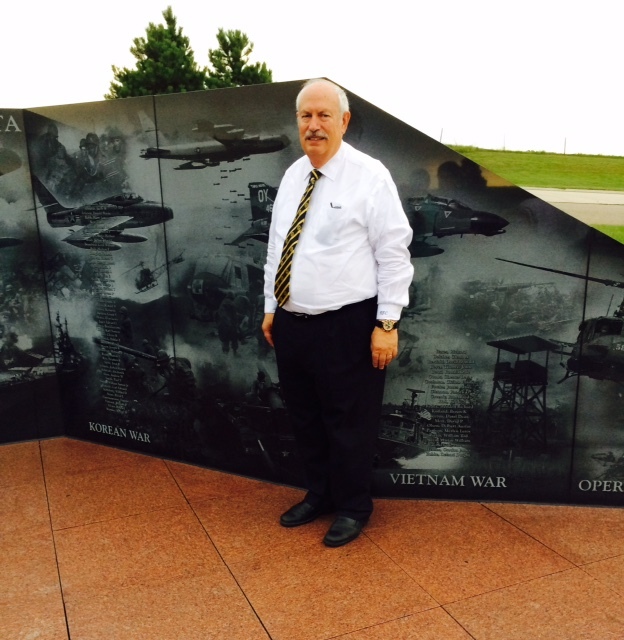 VP Bob Corlew then traveled to Rapid City, South Dakota via Minneapolis, MN. 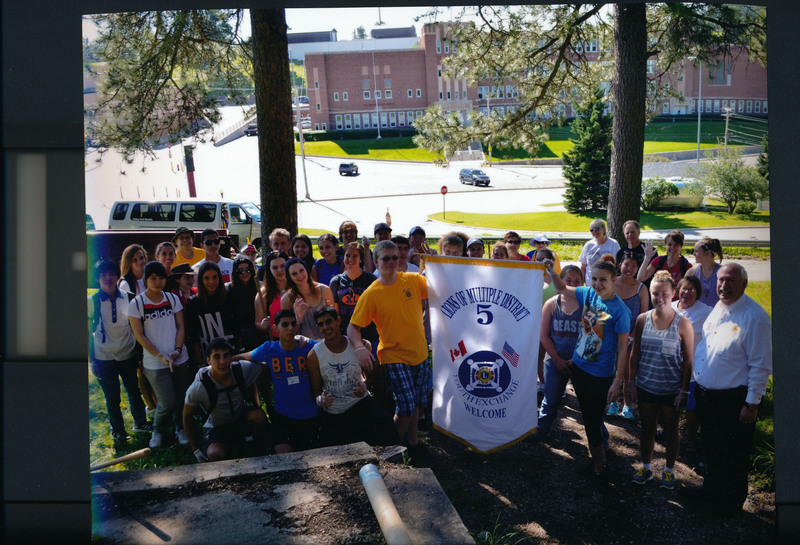 He visited the MD5 International Youth Exchange Camp in the Black Hills of South Dakota and joined the 35 young people in their service project for the camp. MD5 Youth Exchange Camp members, staff, and VP Corlew complete a service project in Lead, SD. They all cleaned a private cemetery in Lead, SD. VP Corlew enjoyed the opportunity to address the group of young people from 11 countries around the world, as well as the counselors and support staff at the camp. After visiting Mount Rushmore National Memorial and Crazy Hourse Monument in the afternoon, chauffeured by PID Bob Drabeck, Corlew met for a dinner meeting with Past International Director Drabeck and PID John Dahm, Immediate Past Council Chair Ken Wetz, all of the current SD District Governors and Vice District Governors, as well as other Lion leaders from South Dakota and North Dakota. Then, on July 14, it was our turn in North Dakota. VP Corlew flew to Bismarck, again via Minneapolis. 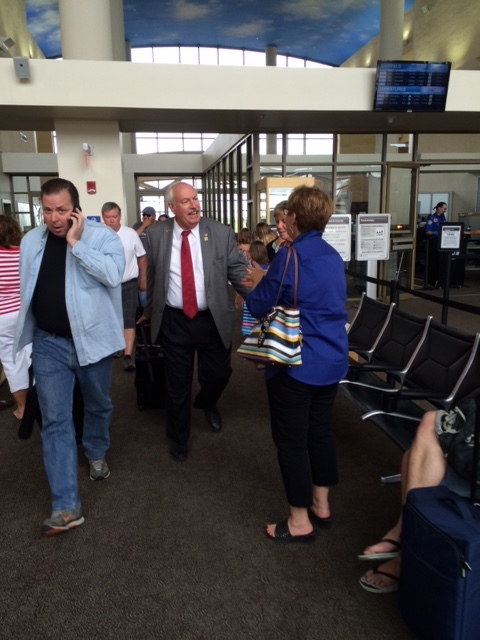 VP Bob greeted by PDG Pat Vannett at the Bismarck airport. The first destination for the Vice President, accompanied by Kathy and me, PID Bruce and Julie Schwartz, PDG Pat and PDG Kevin Vannett, and 1st VDG Mark and Karen Koller was the Lewis and Clark Heritage Center, the 4-H Camp, and the Ferry project in Washburn. 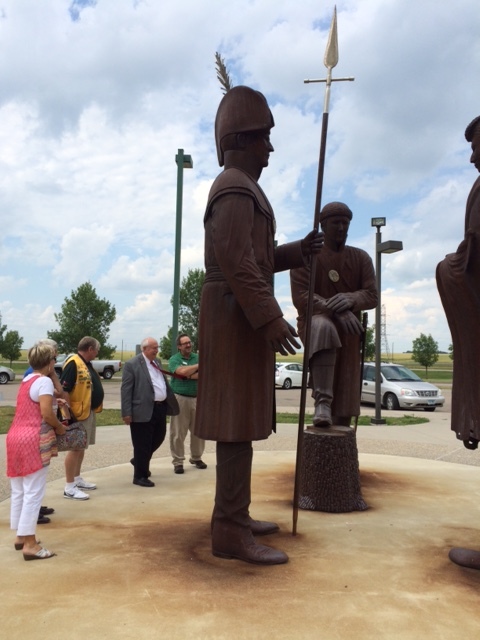 VP Bob stands among the giants at the Lewis and Clark Interpretive Center in Washburn, ND. Lion Mac Beaudry and several Washburn Lions hosted the visitors. The Lions Ferry Project preserves the history of river crossings near Washburn. 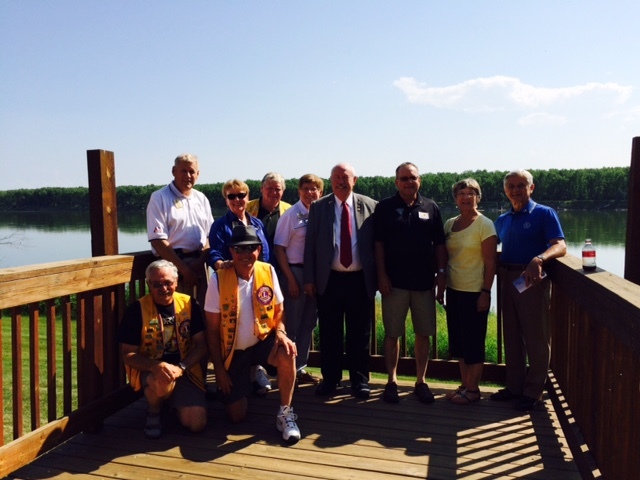 PID Bruce was proud to show the contribution of his Bismarck Lions Club to the Heritage Center grounds. 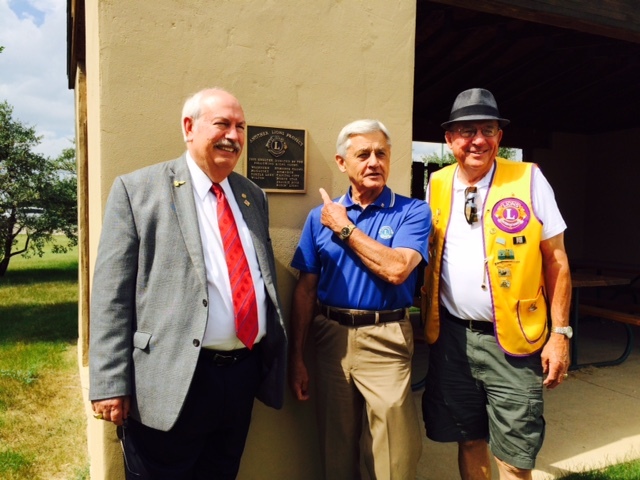 PID Bruce points to the plaque crediting the Bismarck Lions Club. After Washburn, the group returned to Mandan where the Mandan Dakotah Lions were serving burgers in the park. 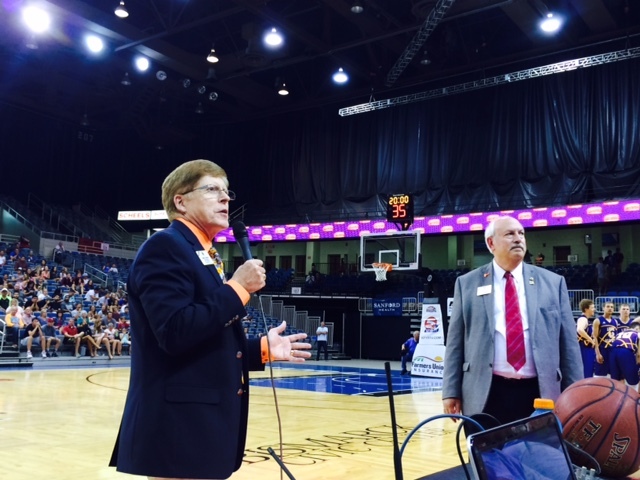 The evening ended with my halftime introduction of VP Corlew at the North Dakota Lions All-Star game at the Civic Center. 39th Annual Lions All Star Basketball event in Bismarck Civic Center. ID Robert introduces to VP Bob to receptive spectators. This activity resulted in a photo and story in the Bismarck Tribune. On July 15, the leadership teams from 5NW and 5NE, along with GLT coordinator PDG Pat Vannett, PID Bruce Schwartz, and I enjoyed a breakfast meeting with VP Corlew. After breakfast, the team traveled to Mandan where several clubs participated in a service project involving cleaning and sorting glasses, as well as preparing them for shipment. 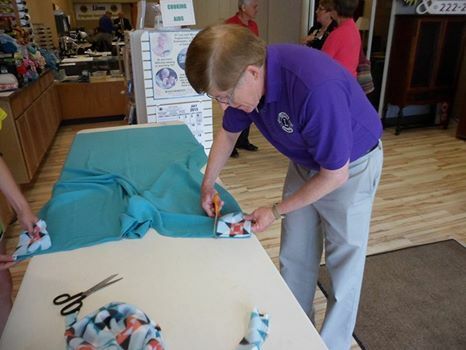 The group also tied blankets for distribution to the Kidney Dialysis Center at the local hospital. The luncheon at the Heritage Center proved to be full of surprises, as the Lions gathered to learn about the Treehouse Project made possible by the generosity of Lion Hollis Nappen and his wife Theodora, deceased members of the Mandan Lions Club. PDG Pat Vannett welcomes VP Bob to the Heritage Center for lunch and tours of the facility. 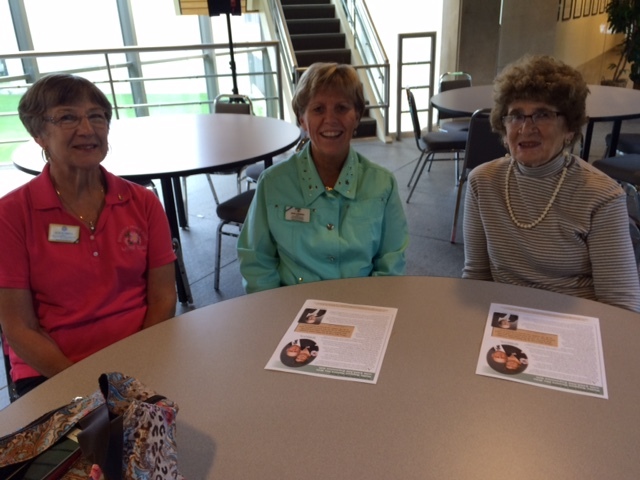 Three very special ND Lion spouses–Julie Schwartz, Kathy Littlefield, and Marilyn Gackle. 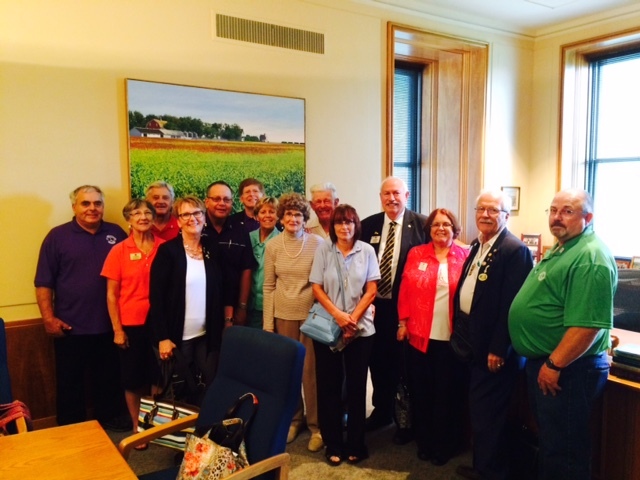 and met with Attorney General Wayne Stenejhem in his office. Later, the group met with the Chief Justice of the ND Supreme Court, Gerald VanDeWalle—the most recent winner of the ND Rough Rider Award. 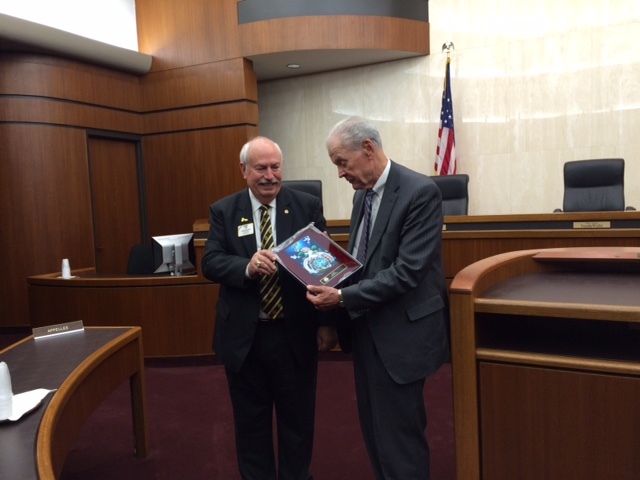 VP Corlew presented the Chief Justice with a Peace Poster plaque from LCI. The day ended with a tour of Fort Lincoln State Park, the Custer House, and the ND Veteran’s Cemetery. 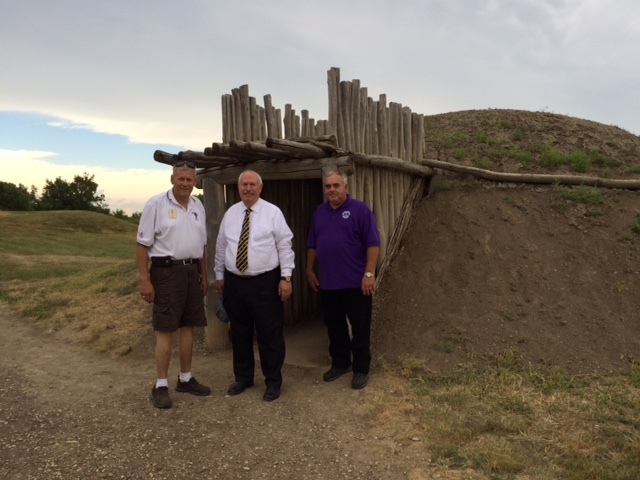 VP Bob (with PDG Kevin Vannett and VDG Keith Zuetschel) visited an Arikara village near the fort. grilled corn on the cob with the Bismarck Lions, and enjoyed burgers and brats sponsored by the Mandan Lions. VP Bob inducts nine new members from three different clubs in the Mandan/Bismarck area. ID Robert presents VP Bob with a Progressive Melvin Jones Fellowship in honor of his visit to MD5. Two special events occurred: VP Corlew installed nine new Lions and I presented the VP with a $1,000 Melvin Jones Progressive Fellowship on behalf of Multiple District 5. We were so pleased and honored to have the VP Corlew as a guest visitor. We ended the day with a stop at the Veteran’s Cemetery and the POW Memorial. VP Bob marks his place by the Vietnam War at the memorial. 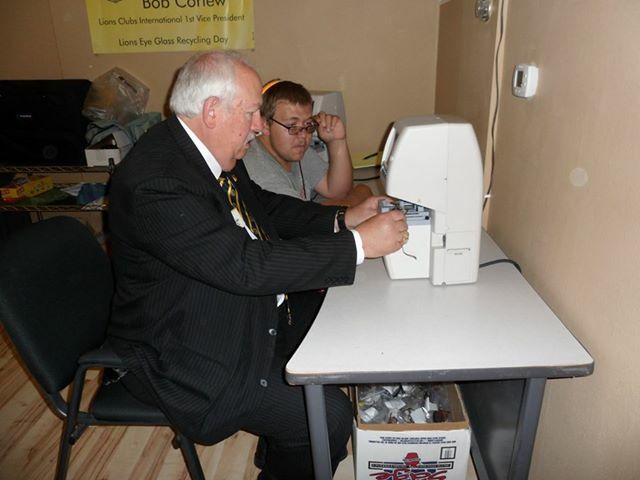 The next morning, VP Corlew, PID Schwartz and I met for a leadership breakfast; and VP Corlew ended his time in North Dakota by attending a vision screening conducted by members of the Prairie Rose Lions Club led by Lion Julie Schwartz. The arrangements for the tour of MD5 were coordinated by PID Marvin Chambers, PCC Ken Wetz, and ID Robert Littlefield. But the success of the trip was made possible by the Lion leaders and club members from across the Multiple District who came out to make VP Corlew feel welcome and learn about who we are as Lions and the depth of our commitment to serving those in need. Thank you everyone who made this a successful visit. Also, thank you to all those who sent me pictures of the different events. We are now off to help our daughter and her family move to their new home. We also will enjoy some fun time with our grandsons. August will hold new opportunities for me as I will be participating in LCIF and Long Range Planning meetings at Oak Brook, IL. The second year of our term has begun and it promises to be a great experience for both of us. We appreciate your continued support, interest, and sharing of the goals of service in Lionism. Best wishes to all who serve. Thank you for sharing this. Of all your columns I think I enjoyed the spirit of this one the most. Always good to hear/read/see what is happening in LCI, and for you and Lion Kathy.